There were a few misconceptions (and a LOT of questions) that popped up in the comments after I wrote about ditching the D4 for a used Phase One camera and back. Videos, answers to Q's and some specific things that convinced me to make the jump, inside. First off, making a jump like this is not an easy decision. In fact, it scared the crap out of me. But one thing that made the research much easier was the fact that Phase One is very committed to educating photographers. They do stuff like this for just about every piece of gear they make. I have long been banging the drum about this approach being a great idea for every photo gear manufacturer. As a customer (even if indirect, as I was buying used) it made a big difference for me. I honestly do not know if anyone is doing the video thing as comprehensively as is Phase One. But the educational component on the site is not just about the gear. They also have video tutorials for many of the main tools and processes in Capture One, their RAW converter / image browser / post production software. Literally, videos pop up to educate you when you launch the program. They are all via YouTube, so anyone can watch them. They are a very small company (relative to Nikon or Canon) so they still have a sense of humor. The tongue-in-cheek video below, done by Phase One with my friend Drew Gardner, is a pretty darn good way to get the point across on build quality and ruggedness. And they video just about everything -- even the brutal climate control tests they perform on the backs themselves. In the end it was of course the file quality that was the main determinant. I looked at a lot of files and talked to a lot of people who had made the jump before me. And I lessened the financial risk by purchasing the kit used. Meaning I could always get out relatively unscathed if things did not work out. It didn't surprise me that there were lots of questions in the comments after the original post. So here are some answers. How will this system work paired together with speedlights or is this baby all about the big lights? I am actually looking forward to using the Phase One with speedlights. Remember, I am a manual guy, so everything works cross platform as always. But the 80mm lens I bought is a leaf shutter version, which means I can sync a full pop at 1/800th of a second. That makes my small lighting bag much more powerful. Shooting at 1/800th vs 1/250th means having the ability to open my aperture up 1 2/3 stops. Which makes my flashes (relatively) more powerful. It is as if every one of my SB-800s went from 60ws to 200ws. Me likee. Do you ever shoot tethered with that back? If so, does the firewire cable have some locking mechanism? Not on a job yet, but I am playing around with it and plan to shoot tethered for a complex photo I have coming up. The firewire connection is very good -- it happens about an inch inside of the back, with the firewire cord going deep into a channel. No worries there. Did you get a roll film back for this 645? Nope. I am done with film. Shot it for 30 years, processed it for 25. Pixels, please. I have always enjoyed all your work and tips. This is why I am so sorry to read this post and know that Nikon 'security' will disappear you within days...if not hours. I'm still here. If they did not disappear me after this post, I figure I am safe. RE: the Phase One back to Camera body locking... Is there a screwdriver lock or some sort of way to make sure it's very, very tight? It's a double-lock system, and feels ridiculously secure. In fact, getting a back off takes a little practice. But the only time I'd want to do that is to clean the sensor. Which has proven to be a wonderfully easy thing to do. I'm curious if you gave the Pentax 645D a look? I like the selection of old lenses that will fit it and it seems more or less in line price-wise with the Phase One. I did. Remember, I was going for format size -- for the look and feel of 120 film. The Pentax sensor is smaller than the P25+, actually more of a hybrid 35/MF size. So that was a consideration. Also, the Pentax system was not modular. You couldn't upgrade the back without swapping bodies, too. Basically, the same restrictions put onto me by the DSLR mafia. As for the selection of new and used lenses, I felt the existing Mamiya lenses gave me the same advantages as the Pentax system. No regrets there. Several people asked what I meant about the dynamic range. I.e., what's the use of having 12 stops of range? Think shadow detail, as far down as you want it. Remember I mentioned Drew sent me a straight image from a shoot we collaborated on? It's a full-range portrait. Skews dark, actually. Lots of deep crevices and the like. Lotta bass in the music. 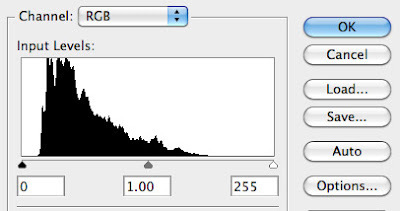 Not allowed to show you Drew's photo yet, but that histogram speaks volumes. That's what twelve stops of tonal range gives you as a starting point in Photoshop. There's no noise in there, either. And 16 bits of pixel depth. It was at that moment I passed the point of no return. How are you finding converting the field-of-view of your lenses in your head? Seeing as you already used APS-C and FF is it not too much trouble to throw a third set of numbers in the mix? Or do you just look through the view finder and what you see is what you see? Remember, I used to shoot Hassy. 80 is a normal, 150 is a portrait, 50 is a wide. And yeah, you just look through the viewfinder and shoot. The difference is that the normal 80 on a big chip gives you a nice, selective depth of field, even at f/8. It's a function of chip size, and what is a "normal" lens. David, regarding your lending program, could you give me a bit of insight to the type of insurance you have on your gear? Any insurance I have is through a business rider with my home insurance company. But they would not cover this. So my risk management is to (a) only deal with people I know, and (b) make it very clear (and in writing) that they are assuming full responsibility for the gear while it is in their possession. Does anything change from a Strobist point of view if you use MF? Maybe additional differences between digital and analog MF? Will there be coming up an MF section on this site? I wonder how its going to affect your power requirements when you want more rather than less depth-of-field? Now that you are using big lights I guess it won't be as much of an issue? I thought about that a lot. Most of the time, I do not need huge depth of field. I tend to shoot portraits in the middle apertures, for natural looking DoF and best sharpness. Landscapes would likely be when I would need extreme DoF, and that's more about a good tripod than flash power. What do you plan on doing for storage as the file output size is massive? Good question. In terms of filesize, the TIFs are ~60MB from my P25+ back. But you can also shoot in one of two Phase One RAW formats that will cut that by up to two thirds. But my biggest line of attack is throwing a lot of crap out. If you are not keeping every frame (bye bye, newspaper days!) that solves a lot of problems. Besides, storage is cheap and getting cheaper. I've been thinking about switching to medium as well. If you don't mind sharing, where did you purchase your used body, back, and lenses for $10K? Seems like a great price and I can't find used Phase One gear anywhere. It's important to note here that I do not use the blog's footprint to negotiate special deals on gear. Not that they are not offered. In fact, while I was caressing a Phase One camera with my grubby little hands at PPE in New York in October, there was a guy from corporate who was offering a special deal. Nothing wrong with that from his perspective. It makes sense to get the camera into as many very public hands as possible. I'd do the same in his position. But from my perspective it is a completely different ethical equation. I value the site's objectivity too much. Long story short, I bought on the used market from a private seller, via eBay. Phase One's build quality and service reputation gave me the confidence to do so. I put up very specific searches on eBay and RSS'ed the results into my Google Reader. That way I would know whenever anything in my target zone came up for sale. Ditto every Craigslist region within driving distance, too. But that is more for bikes and SB-800s than medium format digital gear. I've assisted with commercial studios here in Singapore where we used the phase one backs, and also used the leaf backs when I was doing my course up in Hallmark, so I do agree that Medium format just "feels" that much more different.. the control of focus, and depth of field especially. What I'm wondering is, do you really see the difference in prints? Yes. I looked at several huge prints that Drew had done, hanging both at his home and at the Flash Centre in London. The richness and detail practically made me wanna punch him in the face. It really shows. Lastly, I got a lot of @tweets and mentions saying I had ditched 35mm for medium format. Nope. In fact, the D3 will probably remain my most-used camera. It is a great all-around body. But rather than jump into a D4 I decided to rethink my choice for those photos where Nth-degree quality is the main focus. So, not leaving 35mm. Just drawing the line at how deeply I am willing to go down the 35mm path before looking at another format.